The top of the table is a classic breadboard top. And as it's the most visible part of the whole piece, I wanted to find boards with some nice figure. 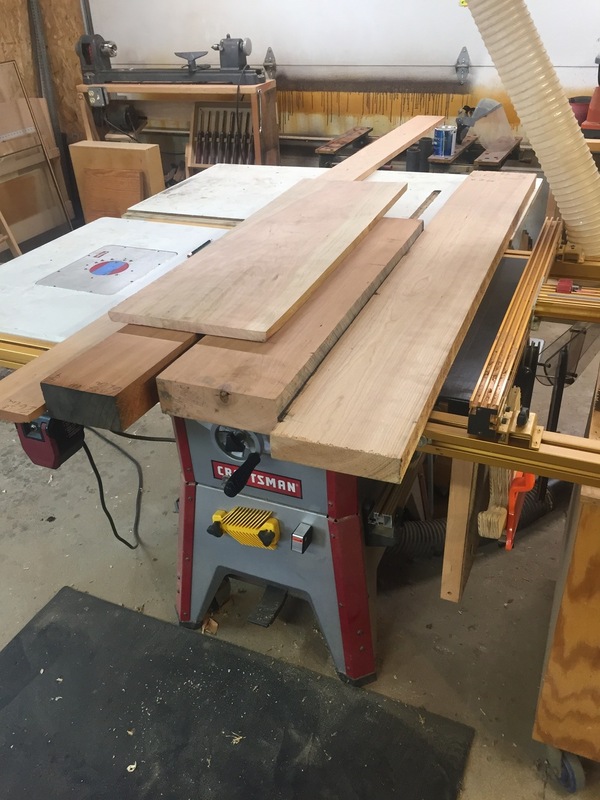 I found a gorgeous nine foot wide cherry board, that, when cut into three sections, would be enough for the main part of the top. It had a mix of light and dark wood, but I knew it would look great laminated together. I liked the contrast it would produce. 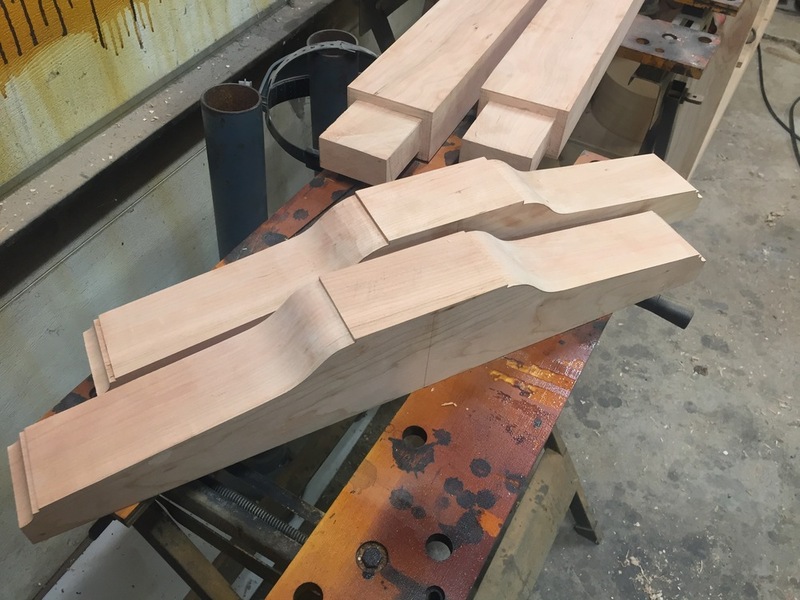 The rest of the cherry was easy source on this run, as the hardwood dealer had plenty on hand, and back at the shop, I got to work. The lamination of the top went well, and before I cut the long tenons for the breadboard ends, I wanted to make the ends first. Those were cut with a hollow chisel mortiser, and cleaned up with a chisel. I was then able to transfer the mortise locations to the top, and then cut the tenons. 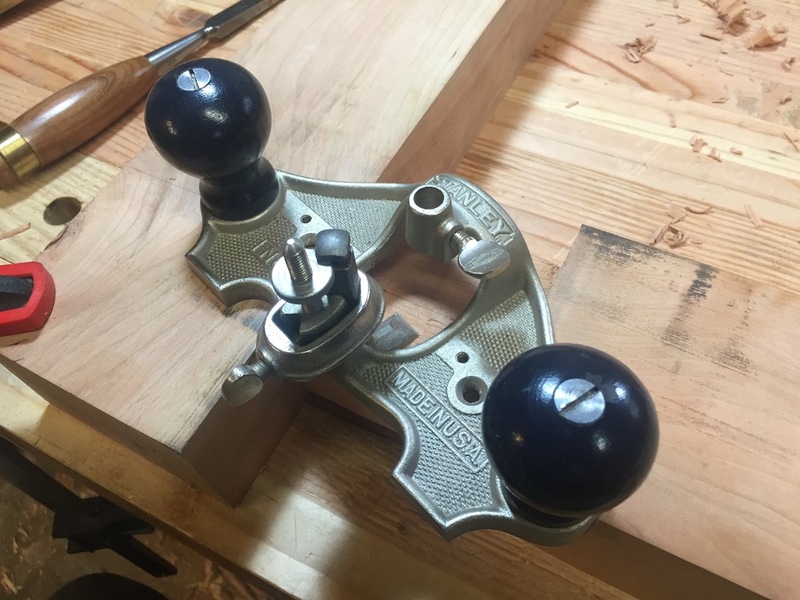 I did those with a guide and a router, and then cleaned it up with a rabbeting block plane and router plane. I then cut out the sections to make the haunches and long tenons with a hand saw, and cleaned up with a chisel. 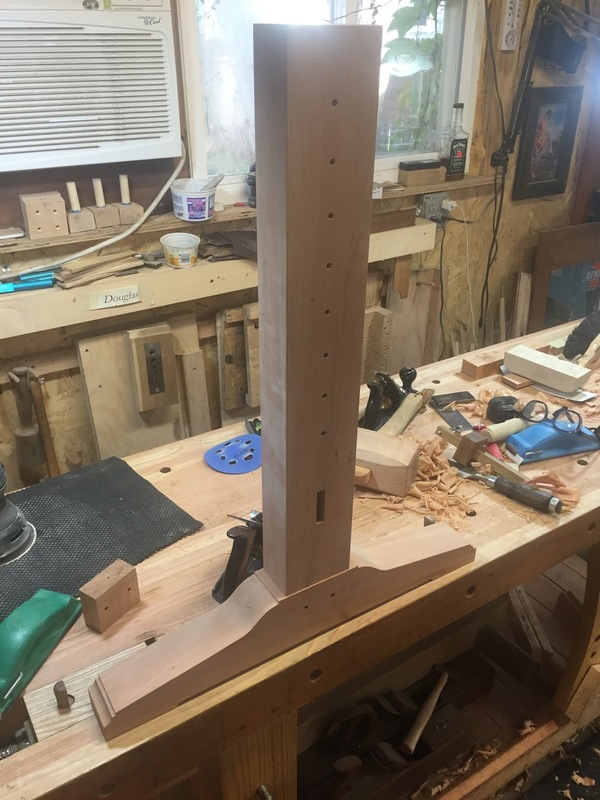 Finally, holes were cut for the pegs, and the ends were begged onto the top, with the out two holes on each side elongated on the tenon to allow for wood movement. There's a lot of work that goes into such a top, but it's worth in, as it stays flay, level, and allows for seasonal movement. Next, I was able to focus on the legs and feet. 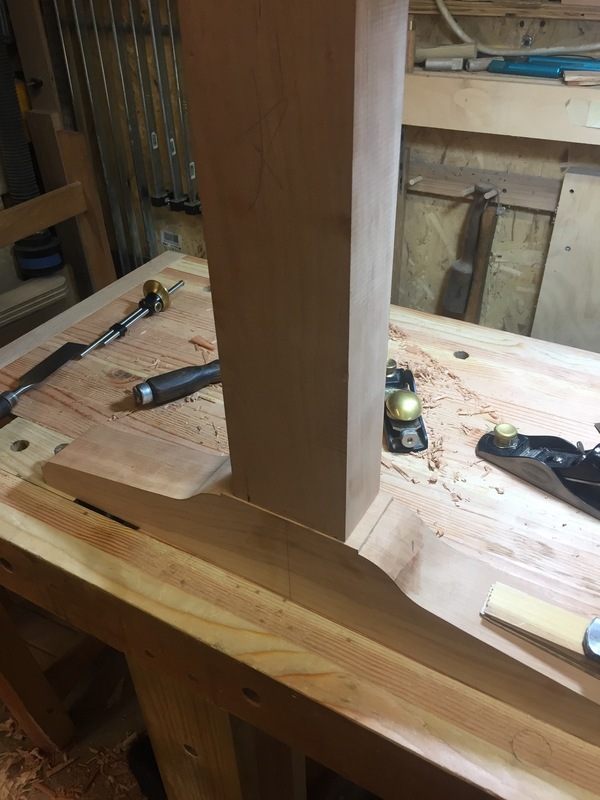 The base features thick legs, with a dado to house the upper part and allow for adjustment, tenoned into a large mortise in the thick feet. The feet gave me a great opportunity to add an architectural element, and laid out a series of shoulders and curves. 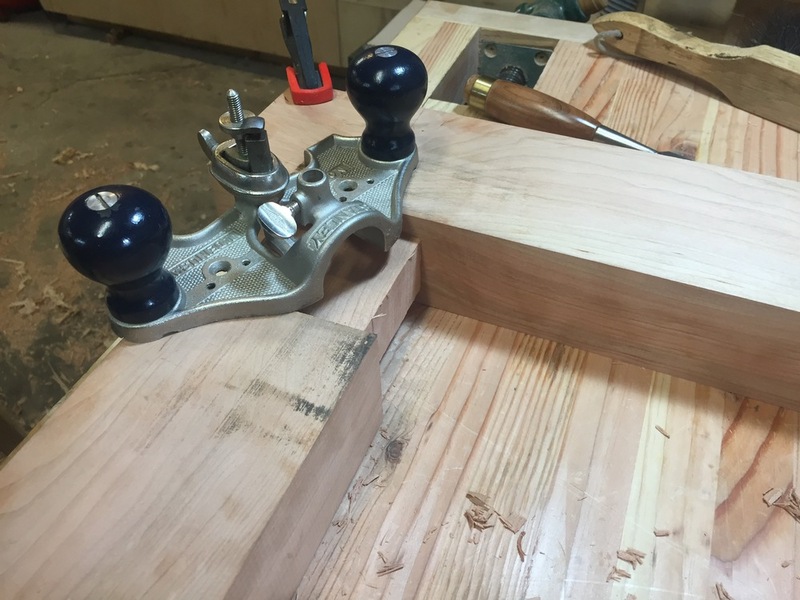 The tenons were cut by hand, and cleaned up with a router plane. 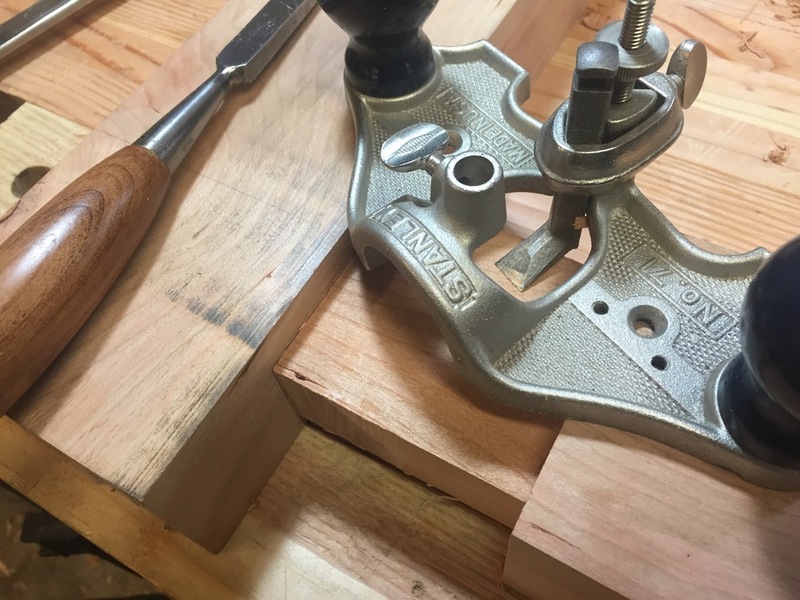 The large dados/housings in each lower leg was a tricky cut, as I had a lot of material to remove. I ended up using a large straight bit in a router table to clear out most of the waste, then cleaned it up with a chisel. 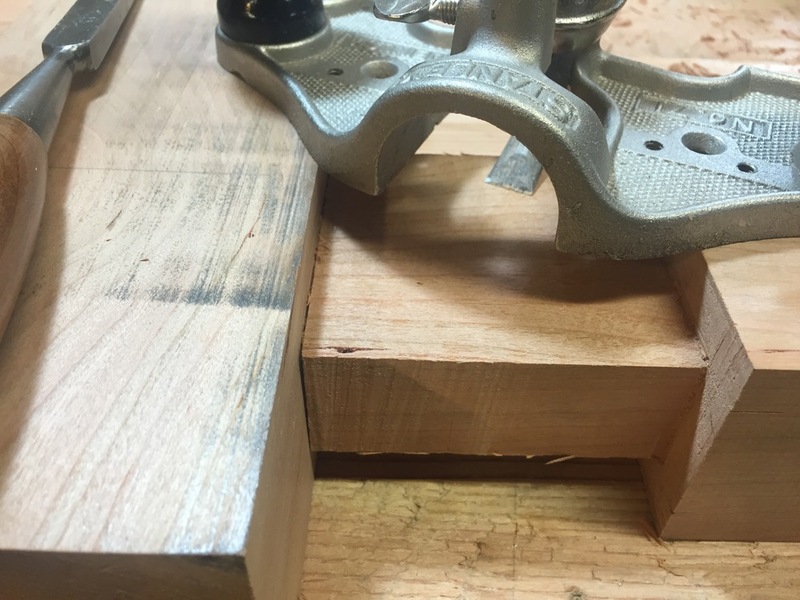 The last part of the base was a stretcher that joined to the two halves, joined with a wedged through tenon. The top section was similar to the bottom, with two smaller "legs" joined by a stretcher. Both pairs of legs needed holes drilled through them to allow for adjusting the table height. Then the last little bit was the tilting portion that connected to the top. I made two shaped brackets, pre-drilled with holes for the top, and detailed with a simple curve. These were then pieced along the tilt access in line with the tilt access on the top of the top legs. To add rigidity, I added a faceted dowel between the swivel points. with the base together, I could attach the top, and see how it all worked together, and it did. I then took it apart, and did the fitting for the hardware, including mortising in the casement window stays that controlled the tilt of the top. Although I still needed the bottom pencil rest, I was ready to finish, and worked on the rest while the finishing process was underway. For cherry, I usually apply a clear shellac. But in this case, I decided to try an amber shellac, which had the effect of "accelerating" the way in which cherry darkens over time. Fresh cherry is very pink, but mellows to a nice medium brown after a couple of years (sunlight depending). Adding the amber shellac gets it closer to that aged cherry look, and will result in a nice blend once the cherry itself ages. So I applied the finish, spraying each section separately; bottom base, top base, and top. After several coats of shellac, sanding in between, I applied paste wax with a 0000 steel wool pad. I then re-assembled everything, appealing the hardware, and finally screwing on to the front end the pencil rest. I couldn't wait to get this table installed in my office. But once I did, I soon realized I needed some accompanying parts to make the whole setup work well. So I built a few quick projects. 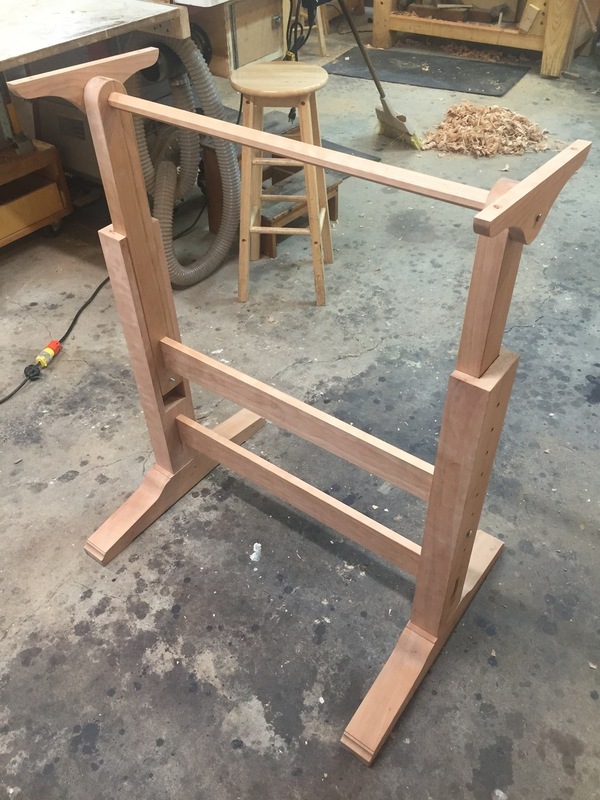 I built a shaker style pine wall shelf for drawing and drafting tools, a cork bulletin board with a cherry frame for the wall behind it, and a little pine tape and pencil caddy to rest on the back edge. And while I originally clamped the drafting light to the top edge of the table, I later made a little wall mounted clamping surface for the light (the lamp clamped to the table made the light too shakey). And with that, I had a nice little drawing and drafting station on my little office. The only piece I have left to build is a nice stool, as the big box store mystery wood knockoff I'm using now wants to fall apart on my any day now. Having a place dedicated to drawing has been wonderful for helping me work out furniture designs, and slowly my drawing skills are improving. And finally, I recently had a great photo session for the piece, and posted those on the gallery. Take a look at the final piece here. Being able to make plans and drawings is an essential skill in building. 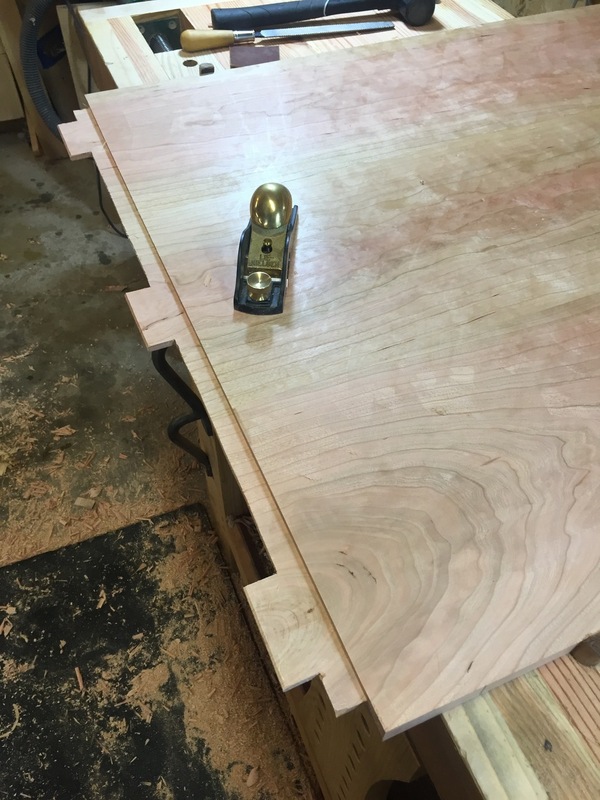 While not all woodworkers (including myself) need to slavishly follow measured drawings to make furniture, the process of working out proportions, construction details, joinery, and overall form before making sawdust is a core step in any build. A popular tool among many woodworkers is the 3D drawing software Sketchup, which they use to (relatively) easily lay out, design, and proportion furniture and woodworking projects. Furniture can be laid out, virtually "built" in 3D, then studied, rotated, scaled, textured, dimensioned, and adjusted easily. Sketchup is a great tool, as it is free, widely used, well documented for woodworking uses, and runs on both Macs & Windows machines. And with my background in IT and computers going back several decades, learning how to use it came very quickly for me. I and fairly handle in it. I once designed my entire kitchen cabinet project to within a 16th of an inch using Sketchup, and it was invaluable. But I'm not so keen on using it as my primary design tool anymore. 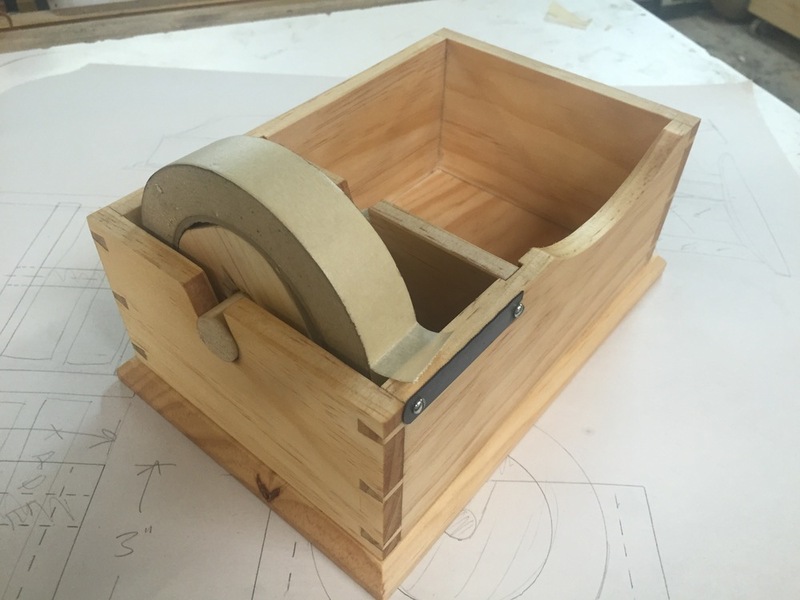 The first issue I have with Sketchup woodworking is that using it involves spending lots of time in front of a computer, something I do more than I want to already for work, some entertainment, and of course writing this blog and promoting myself as a woodworker. It's hard to get excited, and remain undistracted, in front of a computer. There's always something else to check, look at, and fiddle with. It's hard to keep my furniture design inspiration going when sitting down at the computer, again. The next issue that comes into play is that I've wanted to become much better at drawing, sketching, and illustrating by hand. This has been reinforced by the excellent hand drawings I've admired in older woodworking books (as well as some new ones! ), as well as in the design ideas expressed in the book By Hand & Eye by George Walker & Jim Tolpin. Back in high school, I chose drafting classes as my elective courses for all four years. This was back before computer assisted drafting (CAD), and we instead used pencil, paper, and mechanical drafting arms to learn drafting skills. I enjoyed it then, and as a result, I can knock out a fairly serviceable technical drawing when needed. But it wasn't art class, and it wasn't drawing class, so when the rulers and T-squares go away, my drawings start to get a little shakey. But the satisfaction of making a good, useful drawing is still there today, and while I need more practice, the freehand drawing I've done is still proving useful and satisfying. OK, so I wanted to draw more, but now I had another problem: where to do it? The surface of my workbench is a lousy choice. While level, it isn't exactly forgivingly smooth, and any pencil line finds way too many dings and dents along the way, piercing the paper and making drawing there useless. It is also too flat and low. I could clear stuff off my kitchen table, but that's also too flat, and I don't want to stick the ends of my compass into the nice table top a thousand times. I have a self healing mat I could put down, but that's a little spongey, or I could get a piece of hardboard and... and... etc. 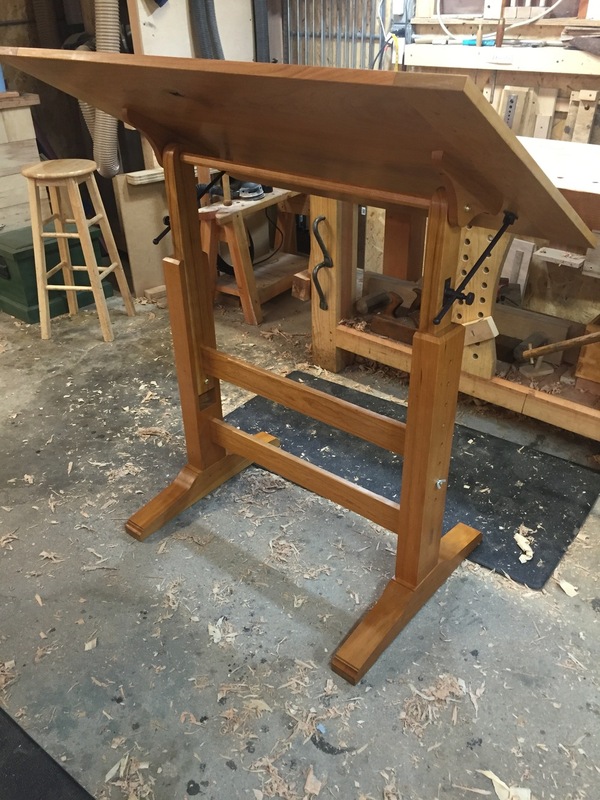 OK, I'm a woodworker, why not build a nice drawing table? Right around the time I was mulling all this over, I happened to be in a little shop in the neighborhood, and saw this drawing / drafting table being used for coffee and scones. I liked the simple design, and the adjustability, and saw I could make one pretty easily from some simple 1" x 3" pine. So, that's was my starting point, and over the next few weeks I worked through what I liked and didn't like about that table's design. The example piece was pretty basic - no frills, not fancy, and designed to get the job done. However, I knew that I wanted something that would be special, and a little more fancy than just-enough-to-get-it-done. My table needed to be a special place where I could feel creative. I wanted to personalize it, and add some extra fit and finish to take it up a notch. I needed to bear in mind that I shouldn't go crazy and have this project take decades to complete - I wanted to get drawing! So I looked for a balance between crude / simple, and fancy / special. ... but short of buying a whole antique table and using the hardware, I could not source modern versions of this anywhere. I finally settled on using casement window stays, which work really well. I can't say I like it as much as the semi-circular hardware, but I'm pretty pleased with how they worked out. So with my design down, I was ready to build. That's coming in part 2.